StarWind Virtual SAN can be installed in many different scenarios, for different purposes. The most “basic” infrastructure which is highly available (HA) (has redundancy) is an infrastructure with just two nodes, with local storage. Compared to VMware vSAN which needs a third node to host a vSAN Witness storing virtual machine witness components, so in the case of a split-brain scenario the Witness contributes towards the object quorum so that the VM can stay available. StarWind Virtual SAN differentiates itself by providing the high availability at the storage level by mirroring the available storage into a shared data store. In case one node fails, the second node is there to hold the VMs and StarWind can determine which node holds the most recent data. In very rare cases when both nodes are down simultaneously and StarWind has difficulties to find out which node has the latest data, you can trigger a manual sync. But in general, the 2-node architecture eliminates the need for third (a Witness) component. We’re heading closer and closer to the point where no spinning media will be used on production storage systems. While it is already a reality in the US, the European markets are a little bit behind due to a cost (with taxes) of Flash over spinning media. For how long? Who knows. Perhaps it might be over in 2018, where we might only see the use of spinning media for backup storage appliances and archiving. Tip: You should check the latest StarWind Virtual SAN Free vs Paid New Offer for 2017 which lifted almost all limits. (No Node limit, no capacity limit). StarWind Virtual SAN installation has been covered quite a few times on our blog. (check the links at the end of this post). Today we’ll get into some further details which might be interesting to know when setting up 2-Node environments, but there are some general guidelines and tips as well. How to configure the underlying storage? You’ll definitely ask yourself which way needs the underlying storage, the local disks, shall be configured. Do I need Raid 5, Raid 6 or what’s best? In order to support HA, and also get some decent performance, StarWind Virtual SAN supports RAID 0, 1, and 10 for flat images. (it means images created on StarWind). Other types of RAID, such as RAID 5, 50, 6, and 60 are supported only on all-flash. When willing to create an LSFS based device, you can use RAID 0, 1, 10, 5, 50, 6, 60. LSFS device is a special device with its own file system (snapshot based), with a journal. We’ll get back to LSFS in one of our future posts as this interesting technology also has a deduplication so it might be interesting to know how it works in details. Use Write Back or Write Through Cache? 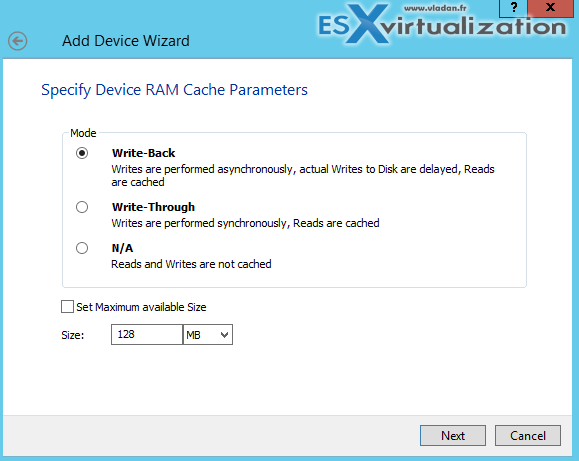 When configuring StarWind devices with the console, StarWind recommends using Write-Back caching. Write-Back caching improves write speed and lowers the latency unlike Write-Through caching which improves only the read speed. Cache expiry period is the time frame data is kept in the cache from the moment of the last access till the moment it is flushed to the disk. What is Hyper-Converged Setup compared to “traditional” setup? Hyper-Converged setup is when you have let’s say two physical servers running VMware ESXi, each box runs StarWind VM, and also other VMs at the same time. It means that both hypervisor and virtual shared storage run on the same physical machine. StarWind creates an iSCSI target which is available to all VMs running on both ESXi boxes. Traditional setup is when you have storage box providing shared storage for your VMs. And those VMs are running on compute node(s), which are separated from storage node(s). Windows Server 2008R2 and higher system with at least 4Gb of RAM. (2016 Server is supported). You can also use Core (2008R2 and higher), or Hyper-V Server (2008R2 and higher), all the way up to Hyper-V Server 2016. If you are planning to use Windows Server Core or Microsoft Hyper-V Server as a base OS you will not be able to install StarWind Management Console locally. For such a case, the StarWind Management console can be installed on any other computer (even Workstation/laptop with at least W7). Please note that for remote management, port 3261 has to be open in both machine’s firewalls. You’ll need to allocate at least 4vCPU to the StarWind VM with 2GHz reserved to ensure the proper StarWind VSA functions. A multi-core CPU with low-frequency cores is preferred compared to one with higher core frequency but fewer cores/sockets. E.g. having a six core Intel Xeon 5660 with 2.8 GHz per core is better than having a four core Intel Xeon 5667 with 3.02 GHz per core. At least Two physical Network interface cards (NICs), each in a separate virtual switch. One for synchronization and backup iSCSI traffic. 1GbE is minimum, but 10GbE is highly recommended. And you might like that last paragraph if you are IT professional, student or certified expert. Check out the Free NFR license offer at StarWind software website here. You can ask for Free NFR if you’re Microsft MVP, MCT, MCP (certified professional). If you’re VMware vExpert, VCP, VCAP, VCIX, VCDX. Or also if you’re a specialized forum member at SpiceHeads, Mangolassi, Reddit members. Lastly, if you’re consultant, trainer, student or blogger. So basically, this option is offered to almost everyone and is really perfect to try the solution in a home lab, or create a test environment at work. Get your NFR here. StarWind Virtual SAN is very flexible software solution packed with features which fit into most environments. By having an easy Windows installation option, the product can be mastered quite fast. And if community support isn’t enough, StarWind has the option to be supported, with its paid option. StarWind vSAN is available as 30-day trial which turns into the free edition. Yes, StarWind offers a Free Edition, a self-supported or community-supported version that can be managed through the PowerShell (or SCVMM). The StarWind Management Console is available only during 30 days. And this is about the only limitations of the free product. What is iSER And Why You Should Care?